The Milan-San Remo race is the first ‘Monument’ of the season and, at 298km, it is the longest professional one-day race. Each of the last two editions has been won by an Australian – Matt Goss in 2011 and Simon Gerrans last year. They are joined by four further previous winners of the race in this year’s edition – Mark Cavendish won in 2009, Fabian Cancellara won in 2008, Filippo Pozzato won in 2006 and Alessandro Petacchi won back in 2005. However, there is a strong favourite this year. Peter Sagan, available at just 7/4, is strongly fancied to win his first Monument, after placing fourth here last year. He has started 2013 in inspired form, winning two stages in both the Tour of Oman and the Tirreno-Adriatico, showing particularly impressive form in winning stage 6 of Tirreno-Adriatico, hanging with the likes of Nibali and Rodriguez on the climbs. The biggest challenge for Sagan will be coping with the fact that he is the strong favourite. He will be closely man-marked by the rest of the riders, although the onus will be on them to do something different to try and get one of their riders away from the Slovak. The usual tactic to lose the sprinters is to keep a high pace on the climbs. This is effective in dropping the likes of Mark Cavendish and Andre Greipel, but Sagan has proved that he has the ability to stick with the pace on these shorter climbs. Instead, they will have to find a way to escape on Poggio and hope a large enough group can get clear to hang on until the finish. In the last two years, a breakaway group on Poggio has reached the end. In 2011, an eight-man group containing the likes of Goss, Gilbert, Cancellara, Ballan and Pozzato made it to the end, while last year, a three-man break, consisting of Cancellara, Gerrans and Nibali contested the stage victory. Multiple riders will have to look to attack on Poggio. The likely attackers should include most of the other strong fancies for the race – Fabian Cancellara, Vincenzo Nibali, Philippe Gilbert, Geraint Thomas, Yoann Offredo, Rinaldo Nocentini amongst others. The problem is that Sagan is likely to be able to stick with the attacks and none of those names have a chance of beating him in a sprint finish if they cannot shake him. The two real chances that riders have are to try and surprise him when he is not expecting an attack, or to attack from a greater distance from the finish and look to time-trial to the end. The obvious candidate here is Fabian Cancellara. He has done it in the past and we know the four-time World Time Trial champion and Olympic gold medallist has the ability to sustain the pace to the line. The two issues are that Sagan knows this and will be keeping a close eye on him, and that Cancellara’s focus might be elsewhere this year. Despite this, if he attacks on the decline off Poggio, he might be able to power his way to the finish. 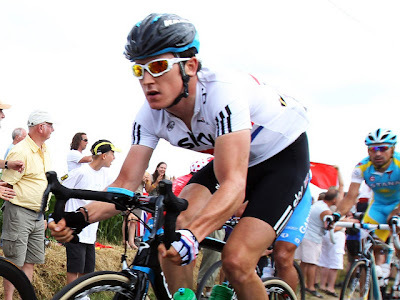 Another possible candidate could be Geraint Thomas. He has the ability to attack on the climbs and he is a good enough time-triallist that he could stay away, although there may be questions surrounding his form given he has not raced since Omloop Het Nieuwsblad. The machine that is Team Sky will almost certainly have a plan as well, one that could well involve Geraint Thomas. They have shown over the past eighteen months how good they can be at controlling races. Obvious, this race is one that is likely to be far more difficult to control, but there is no doubt that they are coming into this race with a plan A, and probably several other plans. Whether they are targeting Thomas, or possibly Boassen Hagen, remains to be seen. More likely though is that various riders attack and Sagan stays with them. He will have to remain alert at all times, especially toward the end of the race. If he can achieve this, he will be tough to beat, although I certainly would not be touching him at the current 7/4.